My name is Steph Booth, I’ve been married to Robert for 3 and a half years, we have 2 beautiful children together, Cobie who is 5 and Lillie who is 4. We live in Skelmanthorpe in Huddersfield. 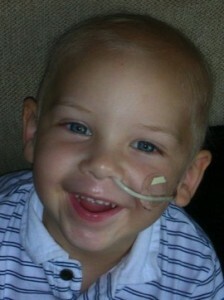 Cobie was about to turn 3 when he was diagnosed with Acute Lymphoblastic Leukaemia on 17th April 2009. His diagnosis was a massive shock as he hadn’t really been poorly, just a bit more tired than usual and off his food. It had been Easter weekend 2009 and we had been at a family get together at the weekend, Cobie had been playing football in his Grandad’s garden with his uncles, and Easter Monday he’d been playing with a friend all day. The Wednesday of that week he started to limp a little bit, but we weren’t too concerned and just thought he had hurt himself while playing all weekend. The following morning he screamed out in pain while in the bath and said his bum hurt, so I made an appointment at the doctors that afternoon. The doctor noticed a rash on his chest and said he couldn’t piece all the symptoms together and asked us to go straight to Barnsley Hospital for a blood test. That following afternoon came the devastating news that they thought it was Leukaemia. We were transferred straight to Sheffield Childrens’ Hospital, and our whole world fell apart. Treatment didn’t go smoothly for Cobie, he seemed to have every side effect going, he lost the ability to walk because of the high doses of steroids, which was particularly bad for Cobie, as Lillie, his sister had just started walking. Cobie didn’t eat or drink a thing for over 3 weeks and ended up having night milk feeds through his NG tube. His portocath was put in wrong and after receiving blood and platelet transfusions, he was rushed to surgery to have his chest drained and flushed to get out the blood which was trapped on his chest wall, he developed blood clots, ended up in ICU, the list goes on. Over the next few months, Cobie got stronger and returned to his old self, the smiley little boy who we love so dearly. One thing that got us throughout this nightmare is the support of family, friends and PACT. Beryl Welburn has been a huge support to our family, she is a friendly face who is always there for us when we need her. It helps that Beryl has been through the same thing as us so knows how we feel as a family. PACT as a charity have supported us in so many ways, we have been on the trips to Sundown Adventure Land, Flamingo Land and Drayton Manor. All 3 have been wonderful days where we got away as a family and forgot all about our daily lives, it was a day to have fun. We also went to the PACT Caravan at Primrose Valley in October 2011, we had a wonderful week away. Another fantastic thing PACT do for the families is the Christmas party, we have been 2 years running now and the kids have a fantastic time, with other kids like them. Myself and a couple of others mums did some fundraising for PACT in Dec 2010 and we managed to raise £1,700 by doing a raffle, we had some fantastic prizes donated by local businesses, hopefully, this will be something we will be able to do again this year, a must if PACT is to carry on helping families like us. I also attended the ball in 2011, a fantastic night which raises so much money for the charity. Cobie finishes treatment at the beginning of July 2012, we can finally see an end to this terrible journey, which has been made so much easier with the support of PACT.